Cross-docking involves delivering products from a manufacturing plant directly to customers with little or no material handling in between. Cross-docking not only reduces material handling but it reduces the need to store the products in the warehouse. In most cases, the products sent from the manufacturing area to the loading dock have been allocated for outbound deliveries. Cross-docking solutions allow companies to expedite shipments to customers, which means that customers often get what they want when they want it — the goal of an optimized supply chain. But cross-docking solutions also come with risks that companies should consider before implementing them into standard operating procedures. There are a number of cross-docking scenarios that are available to the warehouse management. Companies will use the type of cross-docking that is applicable to the type of products that they are shipping. Manufacturing Cross-Docking: This procedure involves the receiving of purchased and inbound products that are required by manufacturing. The warehouse may receive the products and prepare sub-assemblies for the production orders. Distributor Cross-Docking: This process consolidates inbound products from different vendors into a mixed product pallet, which is delivered to the customer when the final item is received. For example, computer parts distributors can source their components from various vendors and combine them into one shipment for the customer. Transportation Cross-Docking: This operation combines shipments from a number of different carriers in the less-than-truckload (LTL) and small-package industries to gain economies of scale. Retail Cross-Docking: This process involves the receipt of products from multiple vendors and sorting them onto outbound trucks for a number of retail stores. This method was used by Wal-Mart in the 1980s. They would procure two types of products, items they sell each day of the year, called staple stock, and large quantities of products that are purchased once and not usually stocked again. This second type of procurement is called direct freight, and Wal-Mart minimizes any warehouse costs with direct freight by using cross-docking and keeping it in the warehouse for as little time as possible. Opportunistic Cross-Docking: This can be used in any warehouse. It involves transferring a product directly from the receiving dock to the outbound shipping dock to meet a customer sales order. There are materials that are better suited to cross-docking than others. The list below shows a number of types of material that are more suited to cross-docking. Because products aren't put away in the company's prescribed fashion during cross-docking, there's an increased risk related to loss of inventory control by using the method the long term. 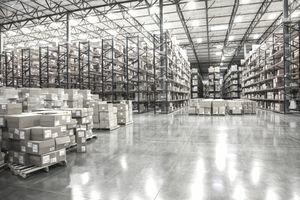 To implement cost-docking effectively, warehouse and supply chain managers should put into place robust inventory control processes and train warehouse employees on those processes. Even though cross-docked items are not put away in the company's prescribed fashion, that does not lessen the need to account for those goods while accounting for stock and reconciling supplier and customer invoices.